I'm not that proud of it, but I fought with my one year over eating this zucchini. Twice. And not the Eat-your-veggies-you-can't-live-off-goldfish-crackers fight. It was more like a Please-stop-eating-all-the-zucchini-and-save-some-for-mom type of battle. This recipe just doesn't seem to make enough to satisfy the two of us, so by the time the last bits of delicious zucchini are being scraped from the pan I'm trying to distract my daughter with string cheese and various fruit so I can enjoy the last few bites myself. There are far worse predicaments to be in, but let me just warn you in advance that you might want to double this dish. This is such a simple, yet delicious way to enjoy zucchini. You shred the zucchini on a box grater, toss it with some salt, and let it sit in a colander for half an hour to pull some of the extra moisture out. Then you lightly press out more water and saute it with a tiny bit of olive oil, garlic and some pepper. The zucchini comes out tender and buttery, which is amazing considering there is no butter in the dish. It is delicious just like this, but when you add some herbed Greek yogurt on top to add some refreshing coolness it becomes outstanding. Seriously. Zucchini. I'm not even kidding when I say I crave this dish. It is by far the simplest, healthiest and most delicious way I've found to eat zucchini. Get yourself to your garden, your neighbor's garden, or your farmers market for some zucchini ASAP and try it out for yourself. And trust me, you will want to double it if you are sharing. Cut off the ends of the zucchini and grate over the coarse side of a box grater to get shreds. Transfer shreds to a colander, toss with 1/2 teaspoon salt, and let stand over the sink or a plate for 30 minutes. Press the zucchini shreds against the side of the colander with your hands, squeezing out excess liquid. Transfer zucchini to several layers of paper towels and pat dry. 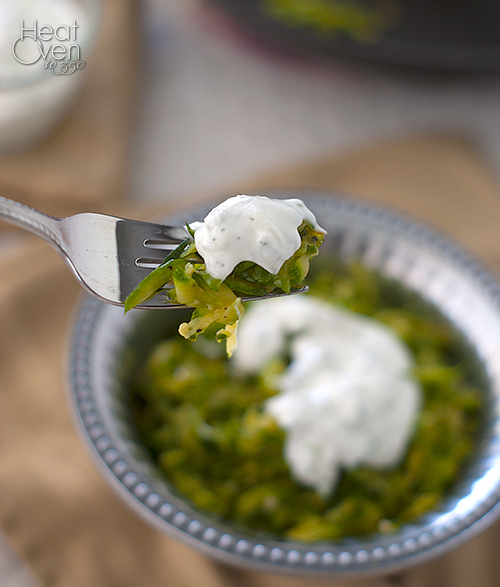 In a small bowl, stir together the Greek yogurt, garlic, green onion, dill weed, lemon juice and kosher salt. Add more salt to taste and refrigerate the mixture. Heat olive oil in a large non-stick skillet over medium heat. Add zucchini and cook, stirring frequently, until shreds soften, about 5-6 minutes. Add garlic and cook and stir another minute. Season to taste with salt and pepper. 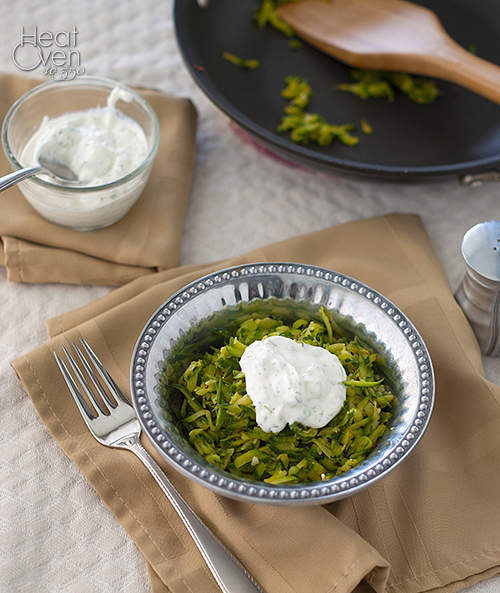 Dish up zucchini and serve, passing the herbed Greek yogurt to put on top. This looks fantastic, and being the zucchini lover that I am, I know I'd have to double it. The herbed Greek yogurt sounds like a great topping for it. Love your photos! I love this! And I love zucchini! Yum. This looks so delicious and right up my vegetable alley. hehe, so glad Amelia likes her green veggies! I'll definitely have to try this...I never really know what to do with zucchini except saute slices of it with onions. Love that she loves zucchini! I didn't end up even trying it (well, unless battered and deep fat fried!) until I was well into my 30s. Love this one! I have a ton of zucchini to use up so this recipe is exactly what I need right now!